INVEN CAPITAL became a tado° shareholder in the spring of 2016. Since then, the former start-up has become a company with 180 employees and a respected player on the global market in building temperature control. Annual sales of thermostats have been growing by hundreds of percent. tado° intends to invest the newly acquired cash into further development and improvement of its products and related maintenance services. The latest round of tado° capital increase with a total volume of EUR 43 million was participated in by renowned investors such as Amazon and Total Energy Ventures. Previous investors in tado° include, for example, Siemens. “The global market in smart thermostats is expected to grow at an annual rate of 50 percent and reach a volume of USD 6.8 billion within four years. Heating and cooling in buildings account for approximately 30 percent of global energy consumption, so there is huge room for innovators offering cost reduction. The company will continue to grow rapidly and we want to be part of it,” explains Petr Míkovec, the managing director of INVEN CAPITAL. 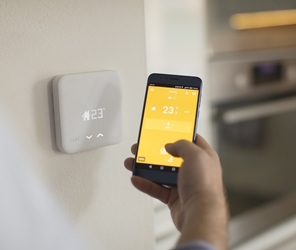 With its current investment, CEZ Group became the biggest investor in tado° with a share of tens of percent; its representatives also sit on the company’s board of directors. ČEZ expects the investment to deepen its expertise in IT and allow it to offer the company’s products to Czech customers. Half of the investment is funded by the European Investment Bank(EIB), which announced its decision to create a joint investment structure with INVEN CAPITAL in late 2017 and provided investment capital of EUR 50 million to be managed by the fund. tado° was founded in Munich in 2011. Its flagship product is a solution for smart home temperature control capable of saving up to 31% of the total costs of heating and air conditioning. Smart thermostats are controlled from a mobile app on home residents’ smartphones (the system automatically detects when they go away or come back home) and work with weather forecast models, allowing them to optimize consumption while maintaining the required thermal comfort. The system is also able to choose the best rates for the user, select the type of heating, or prepare a repair and inspection schedule. INVEN CAPITAL is CEZ Group’s venture capital fund supported by the European Investment Bank (EIB). EIB financing uses funds from the European Fund for Strategic Investments (EFSI). INVEN CAPITAL's strategy is to seek opportunities for investing in smaller, innovative and growing smart energy businesses in Europe. It primarily focuses on later-stage growth investment opportunities with a sound business model proven by realized earnings and long-term growth potential. INVEN CAPITAL’s goal is to generate long-term value through active collaboration with the companies it invests in and to actively support organic or acquisition-based growth strategy. Companies in INVEN CAPITAL’s portfolio can take advantage of CEZ Group’s extensive expertise in the energy sector, client base, and technology synergies for their further development. The fund is a full member of Invest Europe (https://www.investeurope.eu—European Private Equity and Venture Capital Association) and CVCA (http://www.cvca.cz—Czech Private Equity and Venture Capital Association). INVEN CAPITAL’s first investment in 2015 was in sonnen, the Bavaria-based global leader in the manufacture of smart battery energy storage systems for homes. It then acquired stakes in German companies Sunfire, which develops and puts the most progressive energy technologies into industrial production to help reduce CO2 emissions and develop decentralized energy facilities, and tado°, the European leader in smart thermostats. Last year, it bought a stake in Cloud & Heat Technologies, a German company engaged in the energy utilization of heat from decentralized data centers, and Vulog, a French company that is a major global player in technological solutions for green car sharing. The last investment was the entry into Cosmo Tech, a Lyon-based global technology company, specializes in the development of software platforms to optimize decision-making in the management of critical infrastructure and processes. Since then, certain solutions produced by some of the above-mentioned companies have already become part of CEZ Group’s offerings to its customers.